he Golden Fire Dragon Necklace is an example of fine art jewelry inspired by mythic legend and the art of natural form. 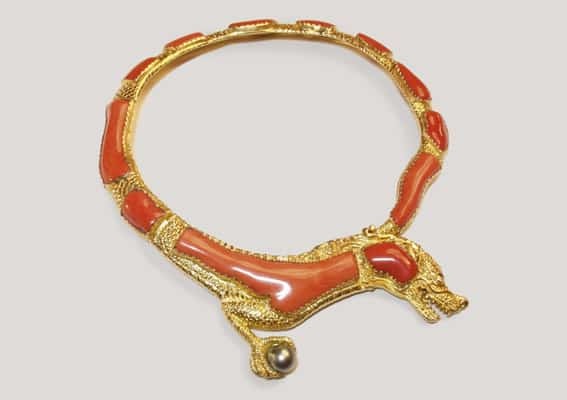 If you look closely, you’ll see that twelve pieces of Mediterranean red coral fit together in a way that forms the body of this exquisitely carved 22 karat gold dragon. The Fire Dragon Necklace harkens back to the first shimmers of time, a time when massive mythical beasts roamed the earth. You see, dinosaurs were thought to be nothing more than the imaginary creatures, until their bones were discovered? The transformation of the prehistoric dragon into the style of dragon that we’ve become familiar with emerged in China somewhere between the Huai and Han period (202 BC.-226 AD.). The Fire Dragon Necklace slightly differs from the common form which is a quadruped with an elongated, scaly body and a horned head. Its jaw is open, with both lips rolled back to reveal it’s sharp fangs. As the traditional dragon is often pictures the Coral Fire Dragon is holding a Black Pearl For the Taoist and Buddhist this is known as the wish fulfilling gem which grants all desire. The Greek root ‘drakos’ means eye which is quite telling because ‘Draco’, is the name of the celestial Dragon. It’s constellation is ruled by the star Kochab and some three thousand years ago, this star was indeed the eye of the north, the vigilant northern star, ‘Guardian of the pole’. Draco’s is a massive constellation that spreads through Urva Major (the Great Bear) and nearly encircles Ursa Minor (the Lesser Bear). Draco’s one hundred and thirty ‘naked eye’ stars (those that can be seen without the aid of a telescope) converge and interweave with several constellations. As is suggested by the stars, the Dragon is a “totemistic” creature, wherein the wings of a bat, the claws of a bear and the thighs of a bull conjoin. Up to nine different beasts make up its massive build. With the strength of a hundred bears, the speed of a whirlwind and a faun’s grace, the Dragon’s dinosaur body appears almost gentle or divine. The ancient Greek Dragon ‘Landon’, echoing a recurrent theme in dragon lore, is not gentle at all, he is the fierce protector of the tree in paradise, that bears the golden fruit of immortality. In China and the far east dragons represent the unfathomable source, the (unknown past) as well as the unruly and chaotic forces of nature, the power of Heaven and Earth. The Fire Dragon Necklace is the part of a fine art jewelry set that includes a matching bracelet.